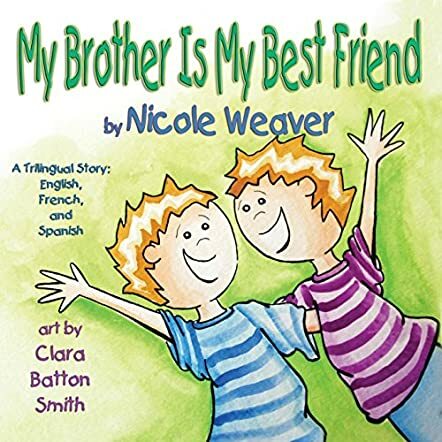 My Brother is my Best Friend is a trilingual story that is written in English, with the text also in French and Spanish. This book is about the friendship and closeness of brothers, and how they love doing things together as they grow up. The brothers in this story are twins and their names are Blake and Drake. In the winter, these twins love playing in the snow and making snowmen, but they also love snuggling up together with their favorite snowmen mugs of hot chocolate. In springtime they like to play in the rain, climb trees, watch the birds and frogs, and play make-believe as they act like the creatures they are watching. Join these two special brothers as they share with young readers what it is like to have a twin brother that is your very best friend. This is a really cute story about the closeness of these twins. I love the different scenes as author Nicole Weaver shares what little boys love to do when playing together. The story is well written, and children will be captivated as the story is read to them, or as they read this neat little story themselves. The illustrations are so very cute, and I love the people, especially the facial expressions, as well as the adorable animals. The lovely scene on each page goes so well with the story; it helps tell the story along with the written words. The different thing about the story is that it is written in English, with French and Spanish directly under the English sentences. This is a really cute and neat idea to introduce kids to other languages. I really like that in the back of the book there is a glossary of Spanish and French words for the kids to find in the story, an English Word Search, and sentences in French and Spanish to be matched with the English sentence in the story. Nicole Weaver uses her stories as a unique and interesting way to teach children other languages. I think you will love this special children’s book, so be sure to purchase one for your child. Thank you Joy for the great review of my book!